A few brief periods of sun punctuated the day, but mostly there was rain and very heavy rain at times. Still waiting out thunderstorm and tornado watches for another couple of hours and listening to the rain come and go against the windows. Early this morning the meditation garden was looking refreshed as the rain cleansed away some of the yellow pine pollen that had settled on everything this week. 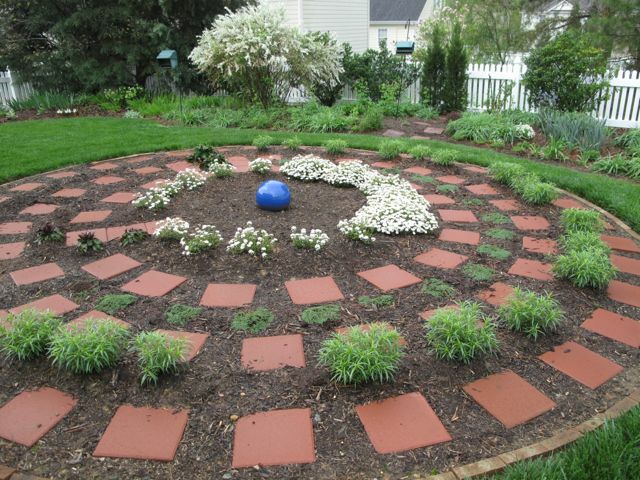 This entry was posted in garden and tagged almanac, labyrinth, meditation circle, meditation garden, meditation path, pine pollen, rain, thunderstorms on March 24, 2012 by pbmgarden. We are in a drought here with threat of hose pipe ban soon. We are in “moderate drought” here and have been under water restrictions since a terrible drought 3-4 years ago. I lost many trees, shrubs and perennials during that time, and it’s one reason my garden has been in such need of renovation. Lots of gaps were left but I was too disheartened for a while to continue. Well, best to you. Hope the conditions improve there. Rain..Natures gift to the garden.